Following the late January guilty verdicts in the espionage trial of former CIA officer Jeffrey Sterling, more proof emerged — if any more were needed — that many elite mainstream journalists abhor whistleblowers and think they should go to prison when they divulge classified information. One would think that a business that has relied on confidential informants for some of the major investigative stories of this and the previous century would applaud whistleblowers who risk everything on behalf of the people’s right to know what its government is doing in the shadows. But looking back at cases over the last five years, we see the unedifying spectacle of some of the nation’s best-known print and broadcast journalists venting their outrage at whistleblowers’ disclosures and expressing their preference for being kept in the dark by the government in the name of national security. Sterling, who has never admitted leaking any classified information, nevertheless with his conviction joined the ranks of those whistleblowers and conduits for whistleblowers who have come under fire from prominent journalists for disclosing classified information to the press — e.g., Wikileaks, Julian Assange, Chelsea (formerly Bradley) Manning, Edward Snowden, John Kiriakou, and others. New York Times columnists Thomas Friedman and David Brooks, Washington Post columnists David Ignatius and Richard Cohen, CNN anchor Wolf Blitzer, NBC’s former Meet the Press host David Gregory, and the New Yorker’s Jeffrey Toobin. These are among the journalistic heavyweights who have in one instance or another come to the defense of the government’s secrecy policies and who have pilloried those making the leaks. And, in the process, they frequently sounded more like government press officers than independent, skeptical watchdogs of the public interest. Of course, some of these outraged members of press royalty have themselves benefited from “approved” government leaks designed to make the leaking parties look good — the kind of leaks that don’t get prosecuted. The ever imaginative Thomas Friedman, in criticizing the NSA leaks, offered up a modern-day version of the Vietnam War’s “we had to bomb the village in order to save it” as the reason to condemn Snowden’s revelations. Read it here. In Friedman’s telling, Americans must not overly concern themselves about our government spying on citizens and must accept a curtailment of privacy and civil liberties today in order to protect the nation and ward off a repeat of 9-11 — which, if it occurred, would lead to an even more serious crackdown on civil liberties. As he wrote: “…(W)e don’t live in a world any longer where our government can protect its citizens from real, not imagined, threats without using big data…under constant judicial review. It’s not ideal. But if one more 9/11-scale attack gets through, the cost to civil liberties will be so much greater.” Yes, a little authoritarianism today will forestall really big authoritarianism down the line. We have even witnessed some journalists suggesting that Glenn Greenwald be charged with crimes for being the primary reporter of Snowden’s NSA disclosures — most notably, NBC’s David Gregory. (Gregory has snottily referred to Greenwald as someone who “claims that he’s a journalist” — as if true journalists are only those, like Gregory, who always bow to government authority.) In June 2013, two weeks after the Snowden revelations, Gregory asked Greenwald on Meet the Press: “To the extent that you have aided and abetted Snowden, even in his current movements, why shouldn’t you, Mr. Greenwald, be charged with a crime?” See video and read here how Greenwald demolished Gregory. Over the years, Greenwald, first with Salon and The Guardian and now with The Intercept, has been the most vigilant documenter of the hostility of many in the mainstream press to whistleblowers and their support for secrecy in all matters connected to whatever the government claims involves a national security issue. See, for example, his 2010 column on the reaction of many journalists, politicians and others to the Wikileaks disclosures. There is also the example of Bill Keller, then executive editor of The New York Times, who famously trashed Julian Assange in the Sunday Times Magazine in early 2011. Although Wikileaks provided a horde of secret documents that the Times used for major news stories, Keller, nevertheless, decided to do a gossipy hit-job on Assange — certainly one of the most peculiar acts of journalistic ingratitude and dumping of one’s source in the modern age. In Sterling’s case, a January 29 article on the “Democracy in America” blog of The Economist came up with a particularly disturbing headline: “Why locking up leakers makes sense.” It was signed with the initials D.R., per The Economist’s tradition of not disclosing full names in bylines. Let that sink in: A writer for a magazine adjudged in journalistic circles to be a serious, prestigious publication, says it strikes a nice balance to have a whistleblower go to jail. The writer skims over the fact that this reprieve for Risen was the result of a policy only recently adopted by outgoing Attorney General Eric Holder and that today’s policy can change from one administration to the next — or even from one attorney general to another in the same administration. There was no binding precedent set in Risen being let off the hook; there is no guarantee that the next brave reporter who refuses to name a source in a national security case won’t end up in jail. And no guarantee that reporter won’t be indicted as a co-conspirator if an attorney general decides to cross that line. In this regard, the Obama administration has already indicated that reporters who benefit from classified leaks can be considered partners in an illegal activity, as was divulged in 2013 in the investigation of a 2009 national security leak to Fox News reporter James Rosen. Rosen was described as a co-conspirator in a government investigator’s affidavit seeking a search warrant to obtain Rosen’s personal e-mails in a leaks case involving North Korea’s nuclear weapons testing. Stephen Kim, a State Department official with particular expertise in North Korea’s nuclear program, was subsequently indicted and pleaded guilty in April 2014 to one count under the Espionage Act of divulging classified information to Rosen. Kim’s case marked an especially egregious misuse of the Espionage Act, as reported by Peter Maass in The Intercept here. A May 2013 Politico article stressed Pincus’s closeness to the CIA and that agency’s point of view, quoting Post columnist Dana Milbank as saying: “Walter conveys the sense of what the intelligence community is thinking on any given subject.” Yes, he does. Even before the Sterling case came to trial, Pincus had displayed animosity toward whistleblowers and some reporters’ dealings with them. He had even said it’s fine for the FBI to get secret warrants to rummage through reporters’ telephone records in investigating leaks, as was the case with six Associated Press reporters and editors. See here and here. And in the month after Snowden’s June 2013 NSA disclosures, Pincus penned a speculative, innuendo-filled column, the gist of which was what he saw as the sinister possibility that Julian Assange, Wikileaks, Glenn Greenwald and filmmaker Laura Poitras had all colluded with Snowden to leak secret documents for them to publish. Greenwald challenged Pincus’s piece over much of a two-day period before the Post finally appended multiple corrections to the article that shot down the key “conspiracy” points Pincus had laid out. Even at this late date, with a record number of at least eight individuals charged by the Obama administration under the 1917 Espionage Act (compared to three such prosecutions for all of Obama’s predecessors combined), many prominent journalists can’t see, or won’t admit, or don’t believe, that an attack on whistleblowers is also an attack on the press and on the First Amendment. They appear either not to care or to have scant awareness of the chilling effect on the symbiotic relationship between investigative reporters and their sources every time whistleblowers are charged or convicted for crimes that could land them in prison for decades, if not a lifetime. They also appear to accept at face value the stories spun by the CIA, the NSA, the Pentagon or other members of the vast U.S. national security state apparatus. It matters not to them the number of times those agencies have been shown to be liars, whether it be over non-existent weapons of mass destruction in Iraq or the extent of the vast surveillance operations directed at American citizens and people worldwide. Why do these stars of the news media so readily brush off concerns about our dangerous warfare/surveillance state revealed by Snowden, Manning and the others? Why do they cheer on the government’s crackdown on unauthorized leaks and tell us surveillance and the diminishment of our civil liberties is really for our own good in a scary world — rather than side with the Bill of Rights and the handful of other journalists and whistleblowers who expose secrets that people in a free society should have the right to know? Why do they sound as if they are angling for a position on the National Security Council or membership in the Council on Foreign Relations, rather than aspiring to be another I.F. Stone (who lived by the tenet, “all governments lie”) or Edward R. Murrow or Seymour Hersh? 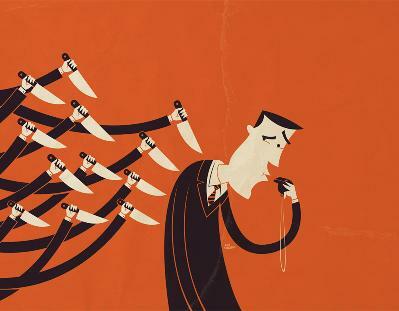 Given the co-dependency of confidential sources and journalists, it would be worthwhile to remind mainstream reporters and editors that when it comes to investigative reporting you, too, are a species of whistleblower. And when a whistleblower goes to jail, a part of our press freedom goes to jail, too.